Like the American Robin, the European Robin is a bird of yards and gardens. But it’s not much bigger than a chickadee. The robin’s likeness turns up everywhere from Mother Goose rhymes, Peter Rabbit stories, and whiskey labels to postage stamps and Christmas cards. 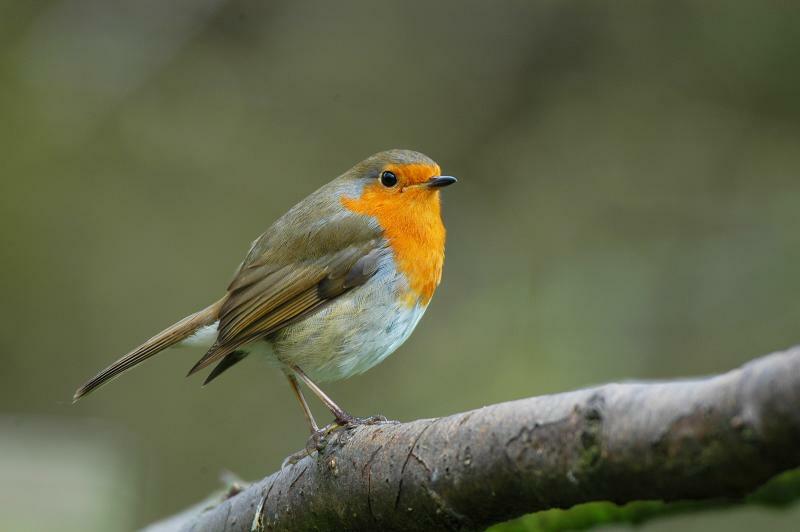 On at least two occasions, the “Robin Red-Breast” has won the popular vote to become the UK’s unofficial national bird. And as for its breast color — one account has it that when the robin visited souls in Purgatory to refresh them with water, its breast was scorched to its current shade. The roots of its common name lie in Europe, though — and a distant relative — a bird not much bigger than a chickadee: the European Robin. And it’s something of a cultural touchstone in the UK. The Robin Red-Breast’s seasonal arrival harkens Spring; it’s been said to signal good luck. And its likeness turns up everywhere from Mother Goose rhymes, Peter Rabbit stories, and whiskey labels, to postage stamps and Christmas cards. The little robin pops up in European folklore, too, including Norse mythology, where it was sacred to mighty Thor.